A refreshing new solidbody design that could ensnare players with its Fender-meets-Gibson charms. Classic is good. We like classic, don’t we? The Tele, Strat, SG, Les Paul… those familiar curves that keep pulling us in like poor saps with their timeless appeal. 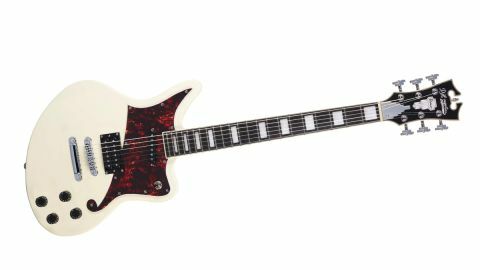 But different can be good too, and if a company can take a new approach and combine it with a sense of class on an instrument that feels like it might be a lost gem… well, then they’re on to something. So D’Angelico’s three new models win our admiration in that regard. The company has entered the solidbody market for the first time with three new bold shapes - the Ludlow, Atlantic and Bedford - available in two series: Deluxe and the more affordable Premier. We’ve chosen this 7lb Premier Bedford as the model to look at here. It’s the company’s flagship design and it also hosts some interesting switching options for players. We’ll get to that shortly. First appearances count and this goes a bit deeper than a pretty offset. The ‘f-hole’ pickguard, matching Art Deco ‘skyscraper’ truss rod cover and machineheads make a statement that are very much aligned with the visual panache of D’Angelico’s famed hollowbody models. At the back, the exposed maple of the C-shape neck is satin smooth with a stylish and subtle double pinstripe along the edge of the ovangkol fingerboard. The four-knob controls mirror the Gibson vibes of the block inlaid neck but we hope you’re sitting down because there’s a twist: the bridge and neck pickups can be coil-tapped with the push/pull tone controls. But, wait, isn’t that a single coil in the neck? Another twist; it’s actually a stacked one. So there's potentially a lot of tonal ground on offer here. That top horn helps to provide a good balance on the strap and plugging it in, the bridge ’bucker is on the darker side to our ears. Overdriven, the tap option proves all the more valuable as it brightens the spectrum, adding some raucous personality. It’s punchy rather than thin; think P-90 punk-rock power. And we found ourselves gravitating towards it. It’s a different affair in the neck position. The Duncan Designed HB-102 stacked single coil STK is bright, beefy and very usable before any coil-tapping. If you do, it gives more breadth for strumming, offering a thinline semi-hollow quality, but there’s scope to move from warm to cutting here, especially when factoring in the middle position and tweaking with the tone controls for each pickup. It all adds up to an, um, solid start for D’Angelico’s new chapter that goes further than visual impact to offer players something distinct tonally, too.